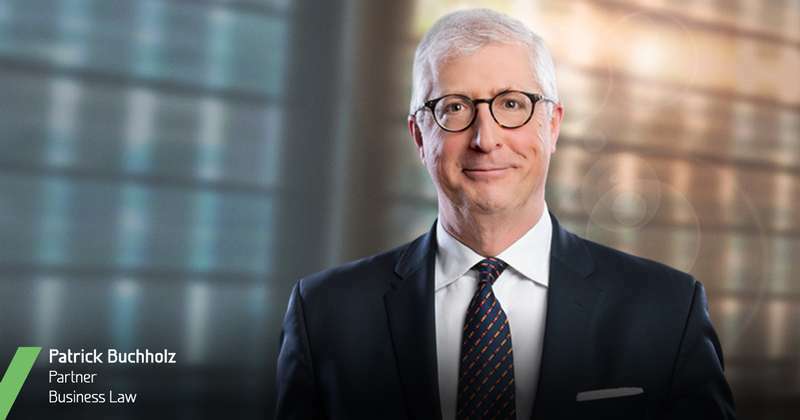 Lavery Lawyers is pleased to announce the appointment of Patrick Buchholz as a partner in its Corporate Law group in Montréal. His practice will focus mainly on mergers and acquisitions, competition law and intellectual property. This is a return to roots for Me Buchholz, as he spent all of his career in private practice at Lavery before joining La Presse. Until recently, Me Buchholz was Vice-President, Legal Affairs and Company Secretary at La Presse, a position he held for 11 years. He played a key role in the media company’s digital transformation by providing legal representation in media and business law and protecting and managing the company’s intellectual property portfolio. Me Buchholz will continue to assist La Presse, remaining as Secretary to its Board of Directors. While at La Presse, Me Buchholz was also Vice-President, Legal Affairs and Company Secretary of Square Victoria Communications Group, Gesca and Square Victoria Digital Properties. In these capacities, he managed the legal aspects of acquisitions and divestitures of equity interests in numerous digital and communications companies, including Du Proprio, Workopolis, Gesca Regional Newspapers and La Presse Télé. In addition, Me Buchholz served as a member of the boards of directors of The Canadian Press and Workopolis. “We are proud that Patrick Buchholz has chosen Lavery for his return to the professional services community. His arrival as a partner consolidates our commitment to offer our clients a 360° legal approach perfectly aligned with the particularities of their businesses. He will bring unique and relevant experience to the table, as well as his extensive legal knowledge for which he is already known. His return among us is a testament to the lasting relationships we build with our alumni and our firm's attractiveness to exceptional professionals. It demonstrates, once again, our commitment to being a leader in the transformation of legal services in Québec,” says Anik Trudel, Lavery's Chief Executive Officer.